U-Shape Flashlamps | TJS Inc.
Our U-shape flashlamps are available in a few standard sizes to suit popular applications. This shape is suitable for circular reflector applications and only requires a moderate amount of glass forming. Our U-shape flashlamps are designed to meet your needs and provide complete customized plug-in solutions – lamps, sockets and integrated trigger coils. 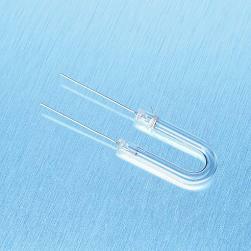 U-shape flash lamps can be produced in all available envelope materials.